On January 29, 1968, which was the eve of the combined NFL/AFL draft, it was announced that the Minnesota Vikings traded their first-round draft picks for both 1968 and ‘69 to the New Orleans Saints for QB Gary Cuozzo. The deal gave the Saints the seventh pick in the ’68 draft. They had lost their first round choice as compensation to the Packers for signing FB Jim Taylor as a free agent in ‘67. Meanwhile, Minnesota still held the first overall pick thanks to their trade with New York the previous year involving QB Fran Tarkenton. It was widely speculated that they would take a lineman with that first choice, and so they did, choosing USC tackle Ron Yary, who would go on to a Hall of Fame career. Cuozzo was 27 years old and had played collegiately at the University of Virginia, where he had also been a Phi Beta Kappa student. He signed with the Baltimore Colts as an undrafted free agent in 1963 and backed up all-time great QB Johnny Unitas for four years, drawing attention when Unitas was injured during the ’65 season. Cuozzo performed capably in relief – in particular, a five-TD passing performance against the Vikings – before he also went down with a shoulder separation. So highly was he regarded that the expansion Saints acquired him from the Colts in 1967 for first and third draft choices plus C Bill Curry. However, he proved to be a poor fit as an immobile quarterback on a weak first-year club and was unable to hold on to the starting job. He completed 51.5 percent of his passes for 1562 yards, averaging just 6.0 yards per attempt, with seven touchdowns against 12 interceptions. “Gary has been in the league for five years. It’s time for him to assert himself,” was the challenge put forth by second-year Head Coach Bud Grant. Finks declined comment on how the trade would affect the status of the three quarterbacks already on the roster, including starter Joe Kapp plus Ron VanderKelen and Bob Berry. The position had been at issue since Tarkenton was traded away. VanderKelen, the long-time apprentice, failed in the early going in 1967 and 29-year-old Joe Kapp, an eight-year veteran of the CFL, was signed to take over the starting job. With his fiery leadership to compensate for a lack of pure passing skill, Kapp did a creditable job – especially considering he had not had the benefit of a training camp with his new team. Minnesota scored just 11 touchdowns through the air in ’67. With some good running backs and a promising group of receivers – not to mention an up-and-coming defense – it was widely believed that obtaining a solid quarterback could make the Vikings a contender in the NFL Central, and that Cuozzo would most likely land the starting job. In fact, it was Kapp starting for the Vikings in 1968 and ’69 as they won the first two division titles in franchise history and the NFL Championship in the second year – although they fell short against the Chiefs in the last pre-merger Super Bowl. But the 1969 season proved to be the last for Kapp in a Minnesota uniform – a contract dispute led to his holding out in ’70 and he was dealt to the Patriots. Cuozzo was finally the starting quarterback for the Vikings in his third season with the club. The team went 12-2 to again top its division (now the NFC Central) but it was the strong defense, not the offense, leading the way. Cuozzo was the conference’s tenth-ranked passer, completing 128 of his 257 throws (49.8 %) for 1720 yards with just seven touchdowns against 10 interceptions, averaging 6.7 yards per attempt and 13.4 yards per completion - only the last number ranked in the league’s top 10. Moreover, Minnesota lost in the Divisional playoff round to the 49ers in a home game in which he performed poorly. In the offseason, the Vikings swung a trade with the Eagles for ten-year veteran QB Norm Snead. Cuozzo ended up starting most of Minnesota’s games in 1971, with young Bob Lee also in the mix along with Snead. Once again the Vikings topped their division with a fine 11-3 tally, and once again they were quickly dispatched in the postseason. The Vikings dealt both Cuozzo and Snead in the offseason. 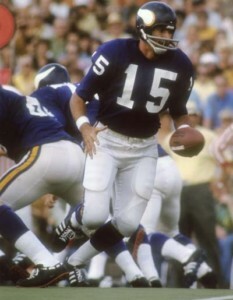 Snead went to the Giants for Fran Tarkenton, the quarterback whose departure following the 1966 season had first set off the process of finding a capable replacement. Cuozzo was traded to the St. Louis Cardinals for WR John Gilliam and a second-round draft choice. Competing with Jim Hart and Tim Van Galder in St. Louis, Cuozzo started six games in his final year in the NFL. An intelligent player and accurate passer, he had neither the arm strength nor leadership ability to succeed consistently as a starting quarterback in the NFL despite being highly sought after. He started a total of 40 games and had a record of 21-19 while completing just under half of his passes (49.4 %) for 7402 yards and 43 touchdowns along with 55 interceptions. His postseason performances were no better. As a footnote, the two first-round draft choices that the Saints received for Cuozzo were used to take Kevin Hardy, a defensive end out of Notre Dame, in 1968 and Xavier guard John Shinners in ’69. Hardy never played for New Orleans, being awarded during the summer to the 49ers along with a 1969 first-round pick as compensation for the signing of free agent WR Dave Parks. He lasted one season in San Francisco and played as a backup for the Packers and Chargers before his disappointing career ended in 1972. Shinners did play with New Orleans for three years before moving on to the Colts for a year and then Cincinnati for five undistinguished seasons.